I flashed the new SW into it tonight. Once I figured it out it was super easy. I also measured a few things. 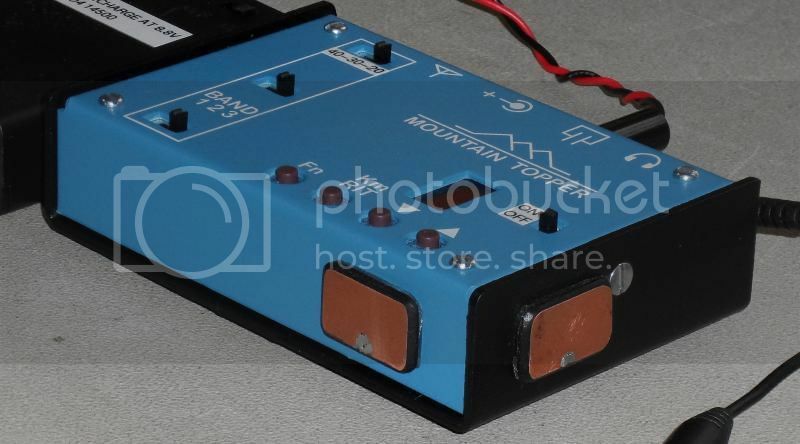 Rx Current = 32mA regardless of band or battery voltage. My 600mAH LiFePO4 batteries should last plenty long. To store my KX1 and Ten-Tec R4020 I've been using $4 plastic pencil boxes. Tonight I decided I would splurge on a Pelican for the MTR. I laid out what I wanted to put in the case. What surprised me is how SMALL the MTR is compared to the other stuff. My SOTA EFHW tuner takes up as much room. I'm going to use 3 AA batteries (LiFePO4, 3.2V each) and that battery pack is almost the size of the MTR. I have a tiny amplified ball speaker and it is half the size of the MTR. My Te-Ne-Key with its base is bigger and twice as heavy. I dunno, it just seems wrong that the radio is dwarfed by the pile of support equipment. At least the key will go away once I put the touch-keyer inside the MTR's box and attach pieces of copper clad on 2 corners for the touch pads. 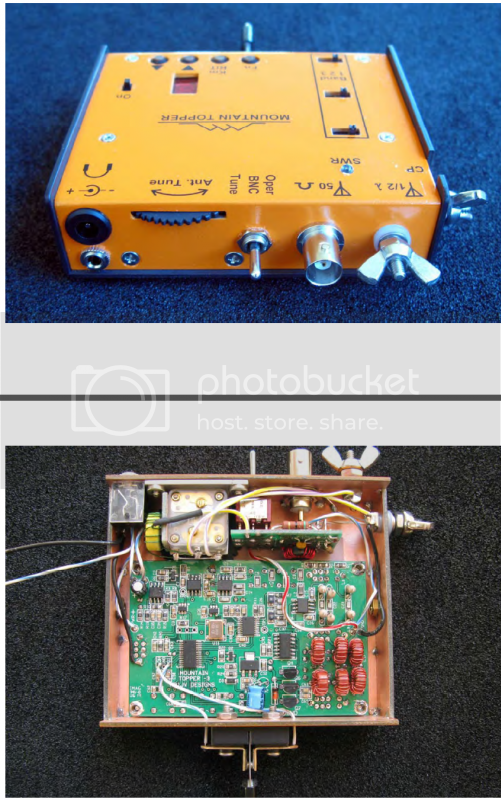 Yeah, I've also noted the irony that my SOTA tuner is almost as big as the my MTR, but yes, building a touch keyer into it helps tremendously to reduce bulk. building a touch keyer into it helps tremendously to reduce bulk. I might ge to the touch-keyer this weekend. I'll post photos when I get to it. I haven't opened the kit's bag. 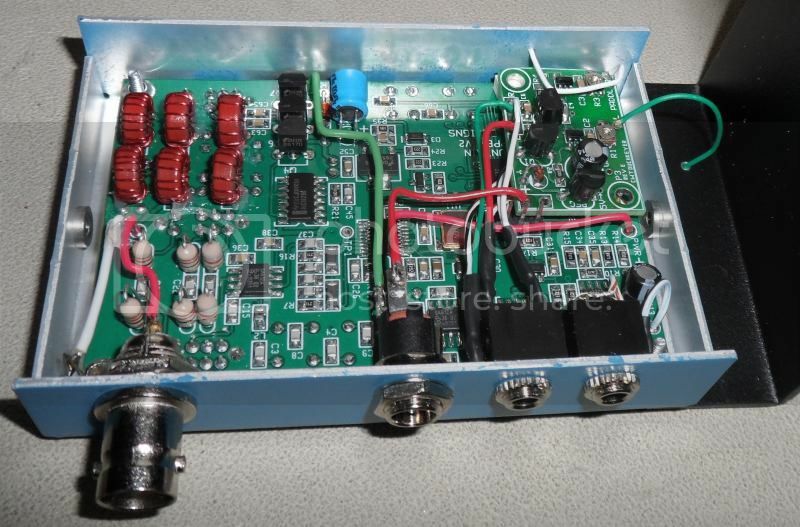 This guy re-packaged his MTR_V2 and included a SOTA tuner and lithium charger. Dammit Bob! Now I'm gonna have to tear my MTR apart and start over....... thanks a lot! It's done! I've had quick QSOs with Arkansas, Finland, Nicaragua and the Canary Islands using my 1/2 wave end fed antenna. The filter is a little tighter than I like, and I'm still getting used to the minimalist user interface, but what a GREAT LITTLE RIG! I really want to thank KK0G for the idea of adding the touch keyer. Having a non-fragile key that takes up no room or weight makes this rig perfect! My whole rig, with key, batteries and ear buds weighs less than 9oz!!!! I lost the piece of black felt, but my wife had some blue felt that's a pretty good match. If any fashion conscious owner wants some, let me know. I've got tons. To keep stray capacitance low, I made my touch pads smaller than KK0G's and attached them with 0.05" thick clear double-sticky tape. I also rounded the edges and painted the edges black for a finished look and feel . * I changed the power connector to a 5.5 x 2.1mm one since everything I have including the KX1 uses that size. The new one installs from the back so that's one less thing to unsolder if I have to remove the board. * The batteries are three 3.2V, 600mAH LiFePO4 in standard AA size. With the rig in beacon mode into a dummy load (15s CQ Tx and 45s listening) they went a full 5hrs. The batteries with holder weigh 3oz. That's a lot of operating for me. After hearing KK0G's complaints about how touchy the adjustment was, I reverse engineered it to see what I could learn (see schematic below). The seller tries to keep his design proprietary. He painted over the 2 chips so you can't read their markings. On the schematic he doesn't label the chips or the key components. I figured it out though. I do this kind of stuff for a living. The chips are Atmel touch sensors. 1) The stray capacitance of the touch pads needs to be kept low. It likes to see 5pf-20pf. 2) C2 & C3 are normally 2nF - 50nF depending on the stray capacitance of the touch pad. 3) High stray capacitance of the touch-pad decreases sensitivity. 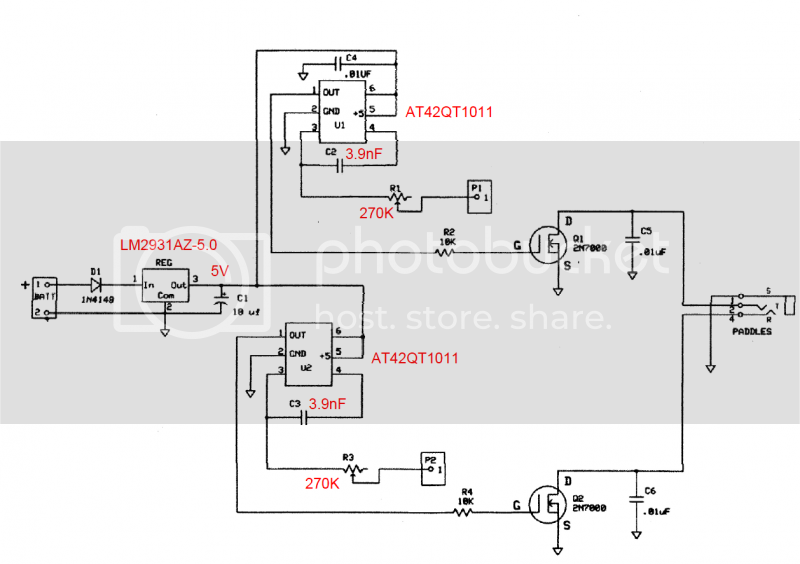 5) The pot's resistance acts with C2 & C3 to form a low pass filter. This helps prevent false touches. Because I spaced my touch pads off the box with thick tape and made them fairly small(0.5" x 0.75"), I have 18pF of stray capacitance to ground. Setting my pots was easy and I have a fairly wide sweet spot. KK0G, I calculate your touch pads are more than 30pF. That's above the data sheet's recommendations and will reduce sensitivity. I'm guessing you had to turn the pots pretty far CCW to reduce their resistance enough for the chip to notice your touch. If it works reliably, great. If you have trouble you could try increasing C2&C3 by 2x or 3x. Wow Bob, nice work, looks beautiful. Thank you very much for the advice. Honestly I don't remember if I had to turn the pots far or not, I just remember it being a bit of a chore getting everything working just right but I suspect you're correct. It's all working fine now but maybe when I get bored during the upcoming winters long nights I'll tear into it to incorporate my SOTA tuner and possibly change C2 & C3. Thanks.